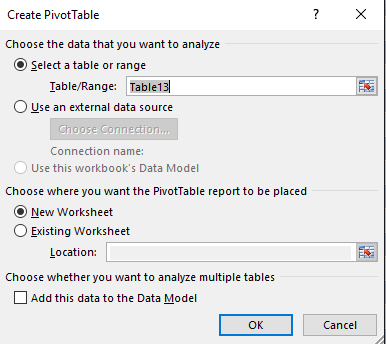 Excel Pivot Tables have a lot of useful calculations under the SHOW VALUES AS option and one that can help you a lot is the PERCENT OF PARENT TOTAL calculation. 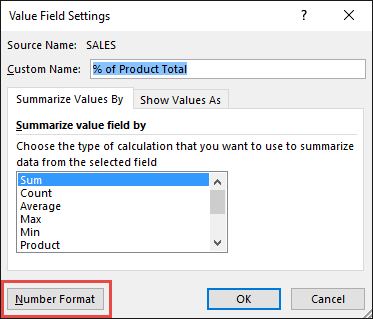 In the example below I show you how to get the Percent of a Product Total i.e The % Sales of each Product broken down by Sales Rep and Quarter. 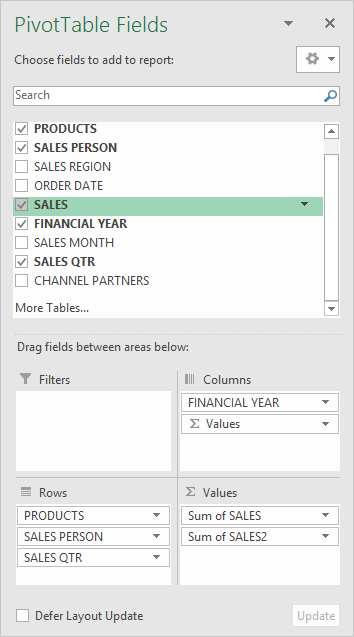 STEP 4: Select the Show Values As tab and from the drop down choose % of Parent Total. Select Products to be our Parent. 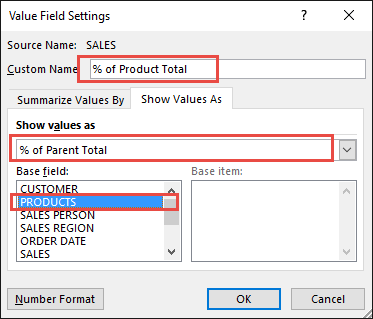 Also change the Custom Name into % of Product Total to make it more presentable. Click OK.
To format the % of Product Total column, click the second Sales field’s (% of Product Total) drop down and choose Value Field Settings. 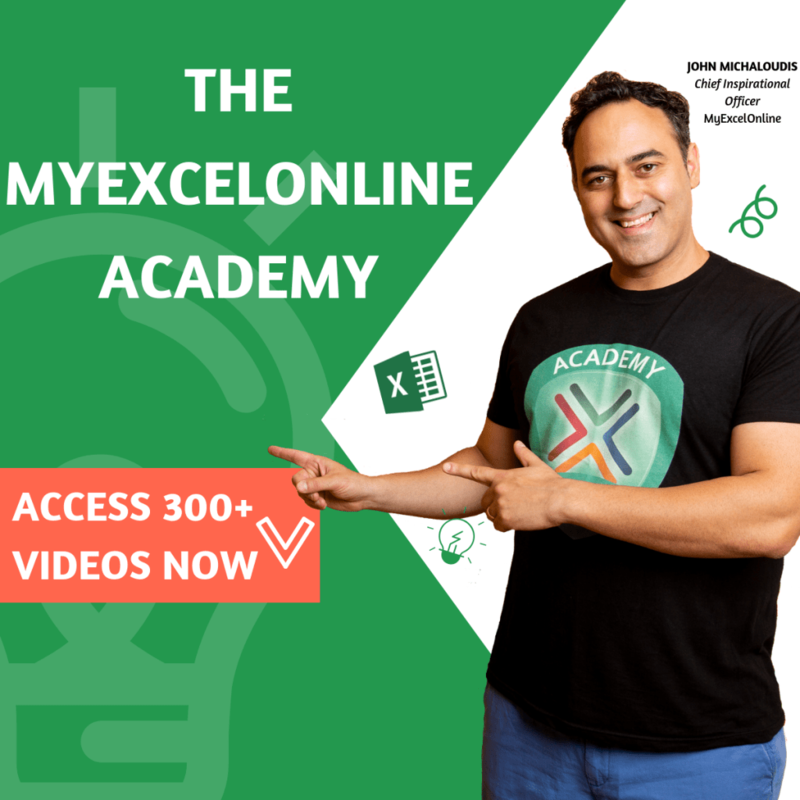 The goal here is for us to transform numbers from a decimal format (i.e. 0.23), into a percentage format that is more readable (i.e. 23%). STEP 6: Click the Number Format button. 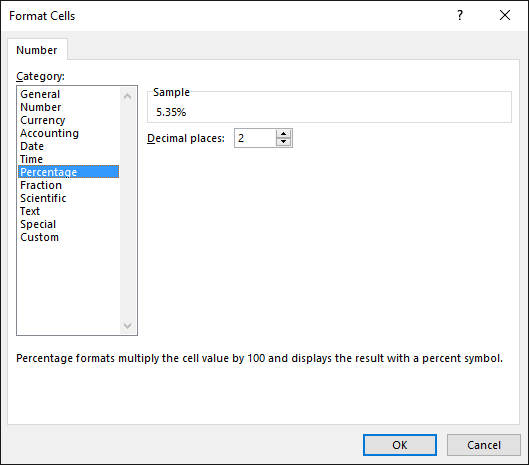 STEP 7: Inside the Format Cells dialog box, make your formatting changes within here and press OK twice. 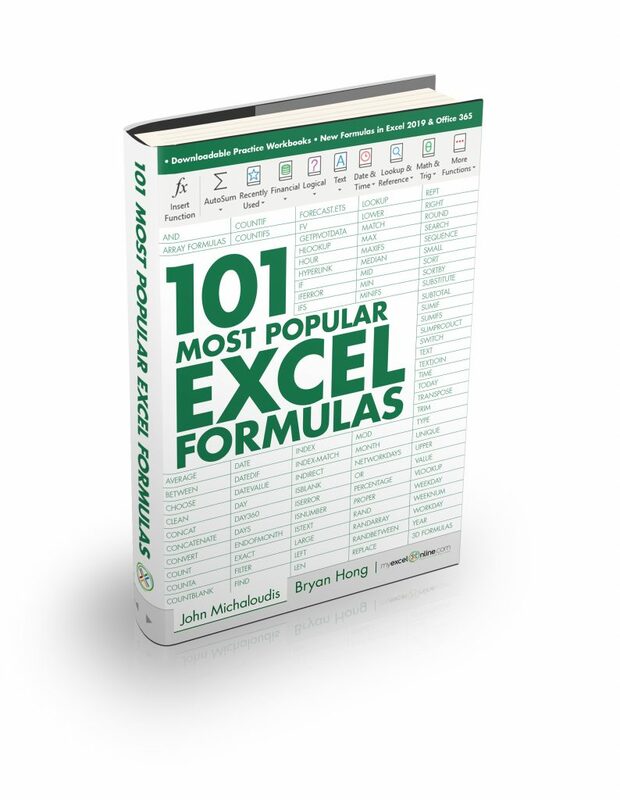 In this example, we used the Percentage category to make our % of Product Total numbers become more readable. 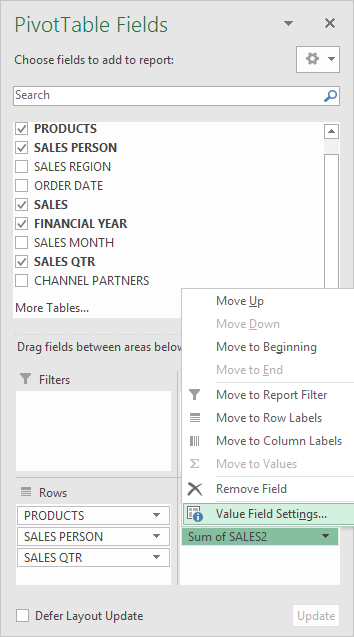 You now have your Pivot Table which shows the % of Product Totals per Sales Rep and Quarter, for the years 2012, 2013, and 2014. 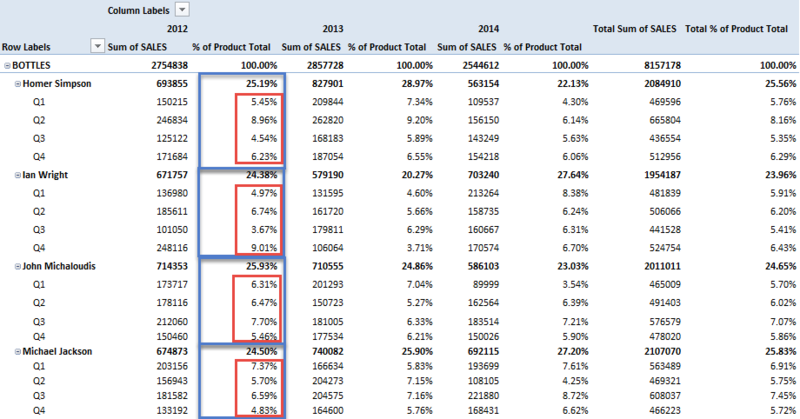 All of the sales numbers are now represented as a Percentage of its Parent i.e the Product Field. 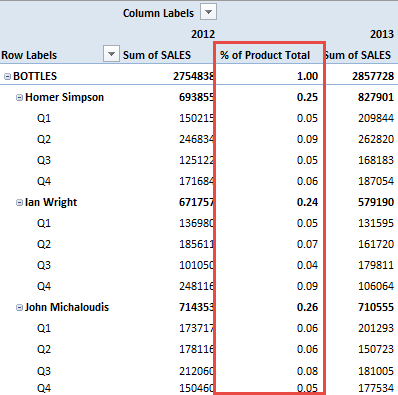 In our screenshot you can see both the values in the blue and red boxes represented as a percentage of the Bottles Product. Adding the values of the red boxes will total to 100%.